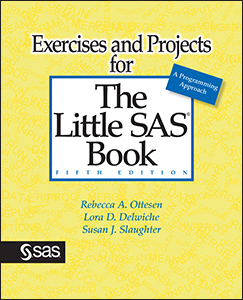 There is a new kid on the block: Exercises and Projects for The Little SAS Book Fifth Edition. Rebecca Ottesen, Lora Delwiche and I have worked for three years to complete this book of multiple choice, short answer, programming exercises, and projects. This book is designed to be used as a supplement to the fifth edition of The Little SAS Book. However, I think this book has turned out so well that someone who just wants practice with SAS programming could use this book by itself. One of the great things about this book is that we have created 77 data sets for the programming exercises, and you can download these data sets for free. For more information about our book or to download the data, click here.